It’s reveal day over at Twelve by Twelve! Our theme this time around was Maps, and I chose a retro- housewife-style direction. It’s worth the visit to see the variety of interpretations from everyone else too. 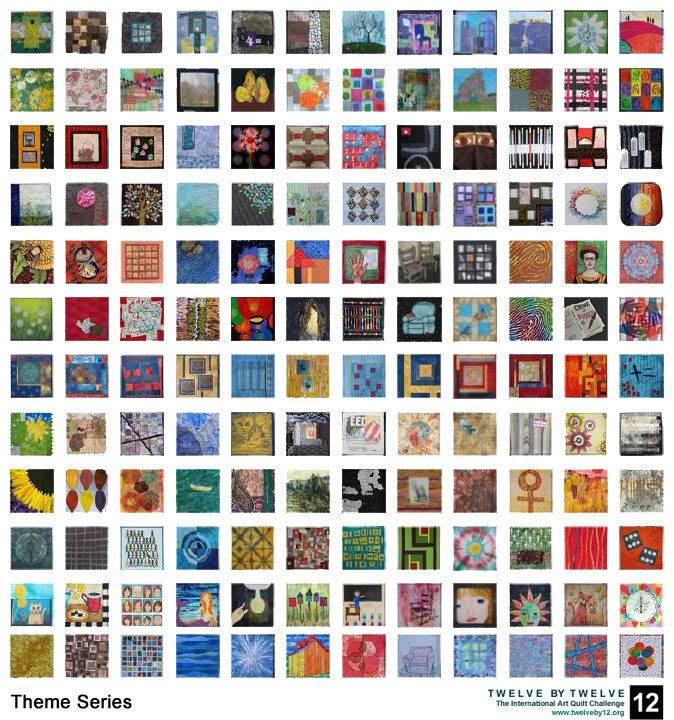 It’s Twelve by Twelve reveal day! After four years of challenges in the 12″ by 12″ format, we’ve changed things up a bit. For 2012, our format is 20″ by 12″ and fittingly, our first theme has been Metamorphosis. 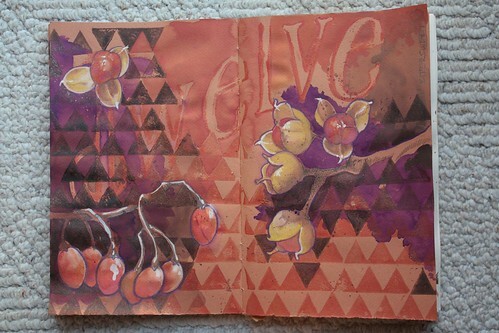 Check out my finished piece, plus what everyone has created over here on the Twelve by Twelve blog. 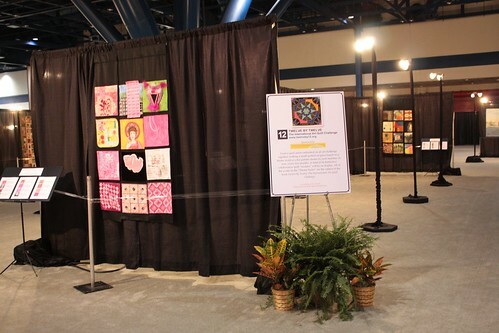 They say everything is bigger in Texas, and the International Quilt Festival in Houston is no exception. Like last year, I’ll break down my experience into several posts. 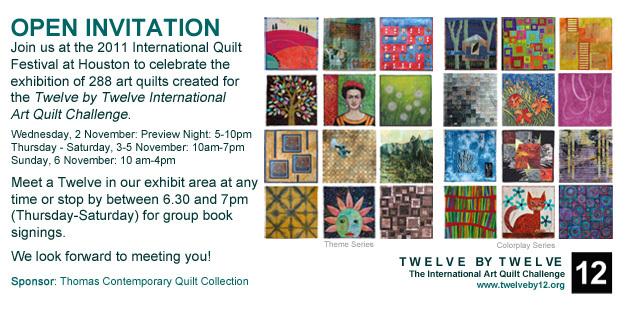 First, the most important and bestest reason to go this year: to see the Twelve by Twelve exhibit and to meet eight of the other eleven twelves, many of whom I’d never met in person! Our exhibit area was two bracket shaped “walls” of drapes facing each other to form somewhat of a room. Flanking each side of the entrance were informational signs and our boldest Colorplay sets. It invited people in perfectly. The big sign explained the project and credited our sponsor, The Thomas Contemporary Quilt Collection as without Del’s support and enthusiasm the exhibit probably wouldn’t have happened. The other side plugged our book, which was a much bigger hit than we anticipated. In fact, the whole experience was more than we anticipated. I expected people to walk through and say that it was nice, but I was blown away by how many people said it was the best exhibit in the whole show! 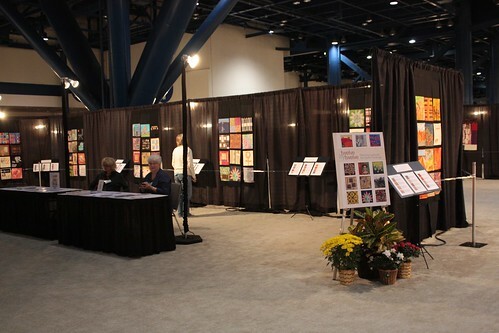 Inside the exhibit were all the Theme series quilts and two tables for us to sit at and sign books or rest our feet. For the most part though, we were up and chatting with all the viewers. The more we told our story, the better people liked the work. There was a steady stream of people all day every day, admiring our work. Amazing. 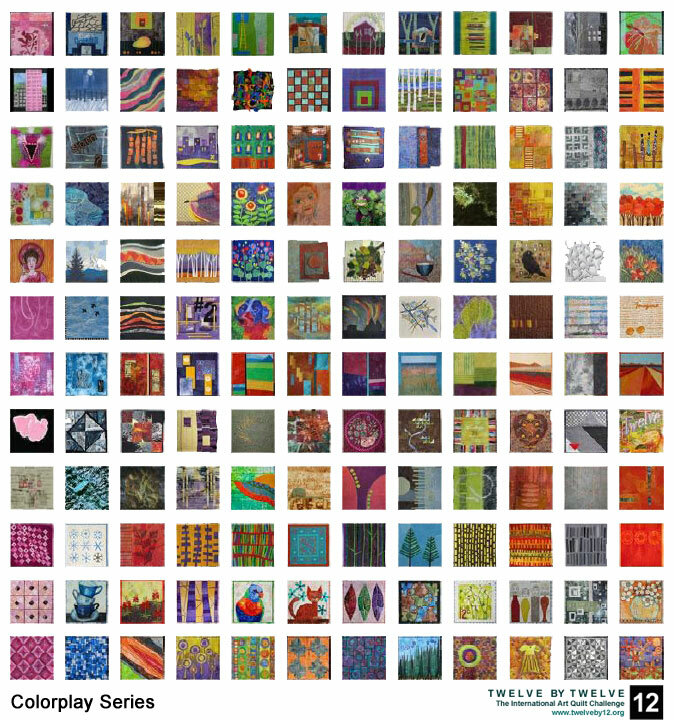 One outer wall showing Colorplay quilts. 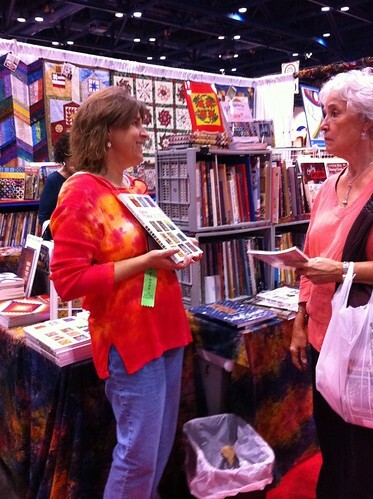 We all took turns signing books at the Quilting Books Unlimited booth. Cathy Neri is so enthusiastic about our book and it was great teamwork to share book sales with her. 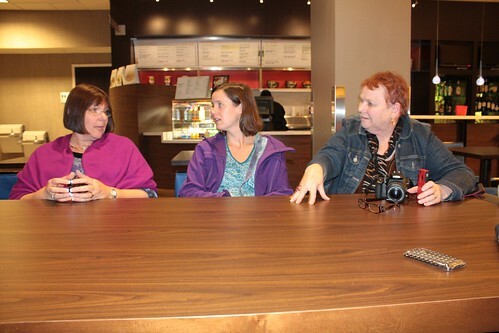 In our “off” hours we had the best time hanging out together, be it at dinner in a restaurant, in the hotel bar/breakfast room/lounge, or in one of our rooms. 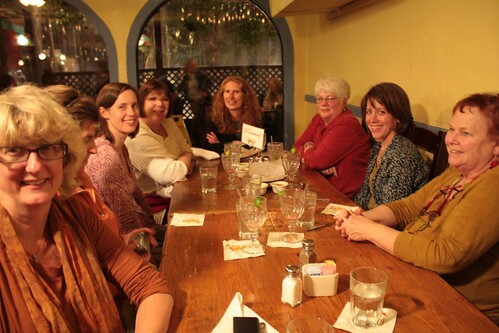 Dinner our first night: Karen, Terri (almost hidden), Nikki, Diane, Brenda, Terry, Deborah, and Gerrie. It’s worthwhile to click on everyone’s links and see their photos and commentary as well. I ended up not getting any pictures of myself, or more importantly, the paper stand-ins of the three Twelves who couldn’t be present that Gerrie made and we took with us most everywhere we went. 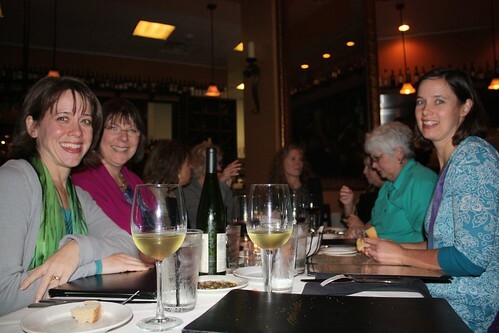 Dinner our third night: Deborah, Diane, Terri, Karen (behind the wine), Brenda, Gerrie (behind Terry), Terry, and Nikki. 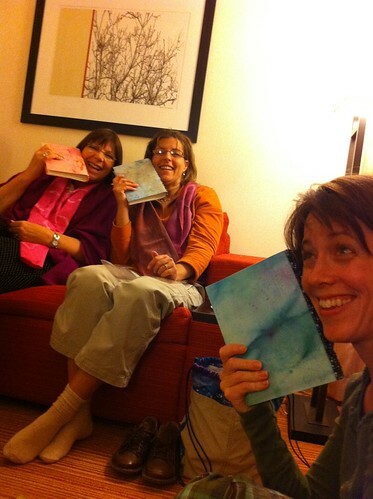 We exchanged gifts one night and Nikki made us each journals with hand painted paper and beaded spines. Not sure what prompted Deborah to rub the beads on her cheek but it was pretty funny when we all followed suit. Technology ruled and kept us (mostly) in touch with each other, those buying our books, and the outside world. 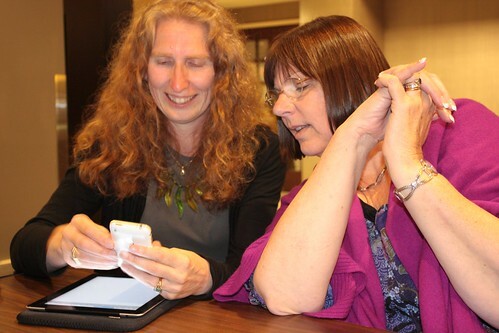 Brenda and Diane reading lovely comments on Facebook, and keeping track of expenses on the iPad. 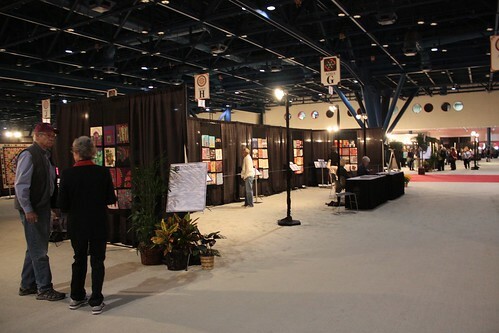 Compared to last year when I made sure to see every exhibit and walk each vendor row, this time I was perfectly content to stay in out Twelve by Twelve area and get to know my old friends a bit better and to interact with our surprisingly enthusiastic viewers. I have some quilt photos and purchases that I’ll share in the next posts, but really, the best part of the experience was hanging with the Twelves! I miss my sisters (and Quilt Mom) already. Come See us in Houston! 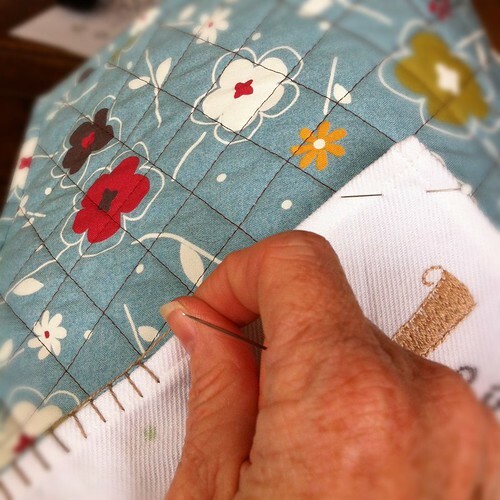 Hey Twelve by Twelve fans — my quilt mom, and the grand dame of our group, Gerrie Congdon, will be on the Pat Sloan radio show Monday the 17th at 4pm Eastern Standard Time. Of course, that’s live — once it’s aired, you can listen anytime. 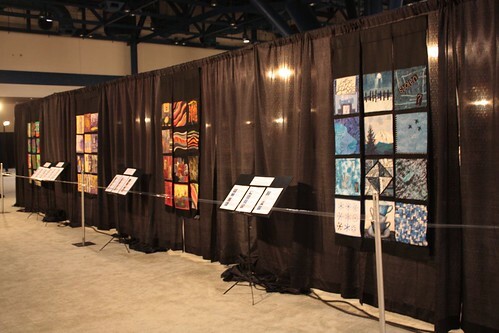 I don’t know exactly what they will talk about, but I suspect that excitement about our exhibit and meet-up at the Houston quilt festival will come up! Woo hoo!